This got me thinking a little more about the category experience. For it seems to me that the current trend of photographing your food is not, as Courtney thinks, an impediment to experience but, instead, is one of the ways in which we actually do experience it — that is, the object of experience, the “it,” is socially constituted and so, without the social (i.e., in this case, social media), there’s no experience to be had. Imagine overhearing, “This is the best steak I’ve ever had,” as a nearby diner dives into a meal, thankfully free of an omnipresent smartphone. But wait, the experience of the meal is created by memories of other meals, other steaks (that this one is better than, apparently), other dining companions and other situations — maybe even anticipations of dinners yet to be had (isn’t that why we smash a glass after a toast? So that it can’t be used for a lesser toast at some future occasion?) And it’s precisely this series of relationships, of similarity and difference, all pivoting on the fulcrum moment of the as yet unsignified present, whereby we connect and rank then and now, there and here, connections and rankings that make it possible to enjoy that steak as the best. Connections and rankings that make the now something to experience. For without all that, without stating it for someone else to hear, to react to, I’m not sure we’d know how to make sense of any sensation. But my initial retort, as I tried to demonstrate later in the text, was evidence of failing to understand that there is no “now” without a sense of then and yet-to-come. Whether we have a smartphone with us or not, we develop a sense of being situated — an identity, for lack of a better word — through a series of practices — identifications, perhaps? — that allow us to juxtapose something with a memory, or maybe even with an anticipation — with a handy comparative standard that allows us to register some it as an item worth paying attention to. 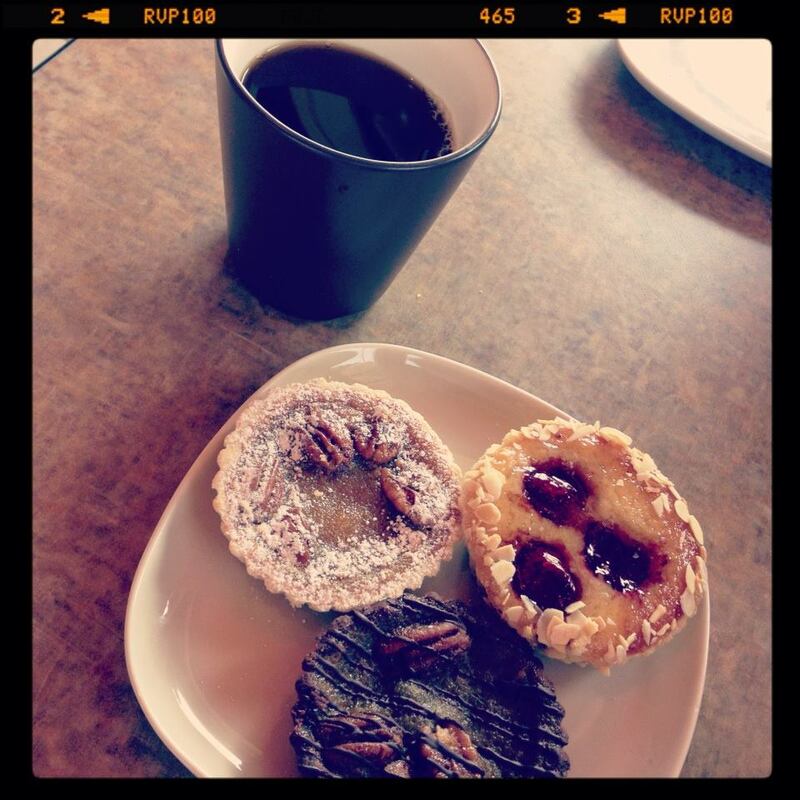 So sharing photos of food — or anything else, for that matter — is one of the ways in which we now come to experience the world around us. Sure, it’s a technology that’s fairly recent, but wanting to share a story, sending a postcard, saying out loud: “I’m full!”, anticipating a reaction or a comment, imagining the other who will be on the receiving end (even if that other is you in the future, looking back on a past that was once a present you made sense of by imagining it as long gone, much like that kid with the torch), is not so very new, really. It may, in fact, be how cognition works: making something of the ambiguous present by simultaneously imagining a past and a future, thereby creating a context in which something now gets to count as worth talking about. 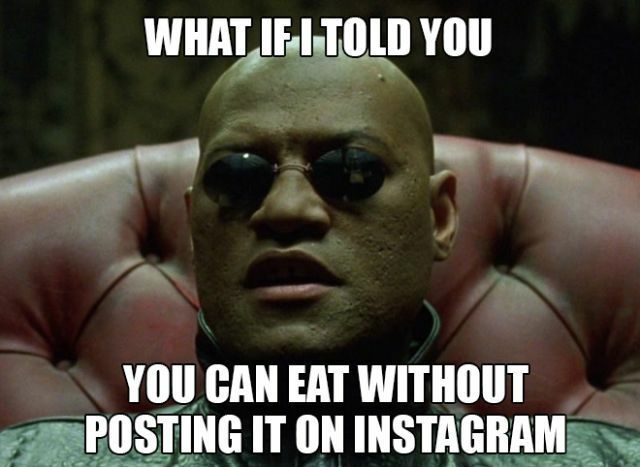 So what if I told you that, while you can indeed eat without posting it on Instagram, I’m not sure you can enjoy it without telling someone else about how much you’re enjoying it — even if that someone is you.